The modern coelacanth (Latimeria) is the extant taxon of a basal sarcopterygian lineage and sister group to tetrapods. Apart from certain apomorphic traits, its morphology is characterized by a high degree of retention of ancestral vertebrate structures and little morphological change. An insight into the molecular evolution that may explain the unchanged character of Latimeria morphology requires the analysis of the expression patterns of developmental regulator genes and their cis-regulatory modules (CRMs). We describe the comparative and functional analysis of the sonic hedgehog (shh) genomic region of Latimeria menadoensis. Several putative enhancers in the Latimeria shh locus have been identified by comparisons to sarcopterygian and actinopterygian extant species. Specific sequence conservation with all known actinopterygian enhancer elements has been detected. However, these elements are selectively missing in more recently diverged actinopterygian and sarcopterygian species. The functionality of the putative Latimeria enhancers was confirmed by reporter gene expression analysis in transient transgenic zebrafish and chick embryos. Latimeria shh CRMs represent the ancestral set of enhancers that have emerged before the split of lobe-finned and ray-finned fishes. In contrast to lineage-specific losses and differentiations in more derived lineages, Latimeria shh enhancers reveal low levels of sequence diversification. High overall sequence conservation of shh conserved noncoding elements (CNE) is consistent with the general trend of high levels of conservation of noncoding DNA in the slowly evolving Latimeria genome. Evolutionary change of cis-regulatory regions is not well understood, and there are conflicting observations about how much cis-regulatory evolution is linked to diversification of gene expression. Compensatory changes in cis-regulatory regions argue for a weak correlation of both [1, 2]. Nevertheless, strong DNA sequence conservation of enhancers of developmental regulator genes [3–8] implies purifying selection to keep such regions preserved across species and functionally constrained in their cis-regulatory functions. Comparative genomics is widely used for the detection of conserved noncoding elements (CNE) which can be examined experimentally for cis-regulatory function [8–12]. Despite certain discussion [13–18], cis-regulatory modules (CRM) are regarded as likely targets for adaptive molecular changes that lead to morphological variation [13, 16]. The modern coelacanth (Latimeria) represents the most basal lineage of living sarcopterygians. Its species diversity is considered to have remained low within its long time of existence of at least 360 million years , with a certain peak of species abundance in the Triassic and Jurassic eras. Concomitant with this reduced species divergence, its morphology has remained almost unchanged . Latimeria possesses structures such as the intercranial joint that are otherwise known only from long-extinct vertebrates. The vertebral column is poorly developed, and the notochord is retained in adults seemingly serving as the principal axial skeleton . Thus, the few morphological changes may be reflected in its ancestral type genetic makeup. Previous studies are in good agreement with this view. The characterization of the Latimeria HOX cluster  and procadherin gene cluster  provide evidence of the slow evolution of the Latimeria genome and conserved noncoding DNA. The orthologous Otx2 enhancers FM and AM  and the HoxC8 early enhancer  revealed strong conservation in DNA sequence and in enhancer expression in mouse transgenic experiments. To study the evolution of the regulatory architecture of a developmental gene, sonic hedgehog (shh) provides a good candidate. The shh gene encodes a morphogen that directs many developmental processes in vertebrates [26–28]. The transcriptional regulation of shh is tightly regulated, and its expression in the embryonic midline is specific to the ventral neural tube and the notochord. Those shh tissue-specific expression domains are conserved in a wide range of vertebrate species such as in mouse and zebrafish [26, 27] but also in the agnathan lamprey  and chondrichthyan dogfish . The cis-regulatory regions that regulate shh expression in the central nervous system and the notochord have been mapped extensively in several species and have been functionally characterized in mouse and zebrafish [31–40]. Thus, shh represents an ideal gene locus for a detailed examination of cis-regulatory sequence conservation in the context of the slow genome sequence evolution and the ancient type morphology of the coelacanth. In our report, we demonstrate that the Latimeria menadoensis shh locus contains all conserved proximal enhancers shared nonuniformly by fishes and land vertebrates. We provide experimental verification for enhancer activity of the putative Latimeria enhancers in transgenic zebrafish and electroporated chick embryos. From DNA sequence comparison of the shh locus of different vertebrate lineages, we infer that Latimeria conserved noncoding elements represent the ancestral gnathostome set of enhancers that diverged variably during vertebrate evolution. Three variants of hedgehog exon 2 [GenBank accession numbers FJ603041, FJ603042 and FJ603043] sequences were obtained by polymerase chain reaction (PCR) from genomic DNA of Latimeria chalumnae using degenerate primers. The shh-specific paralog was deduced from DNA sequence comparisons and used as a probe to screen a Latimeria menadoensis BAC (Bacterial Artificial Chromosome) library . The BAC clone 123-O2 was shotgun sequenced, and approximately 1200 sequence reads resulted in a 5X DNA coverage of the BAC clone. After assembly, a 20-kb contig was obtained that encompasses the shh genomic region, spanning from 8 kb upstream to 12 kb downstream of the predicted shh start codon [GenBank accession number FJ603040]. Repetitive DNA and interspersed elements made it difficult to align the entire BAC clone sequence in a single contig, and correct assembly was verified for the 20-kb region by PCR amplifications. The shh coding portion was deduced from DNA sequence comparisons to mouse and chick shh. Phylogeny reconstruction with shh coding sequences of higher vertebrate species indicated that indeed the Latimeria shh orthologous gene had been sequenced (Figure 1). 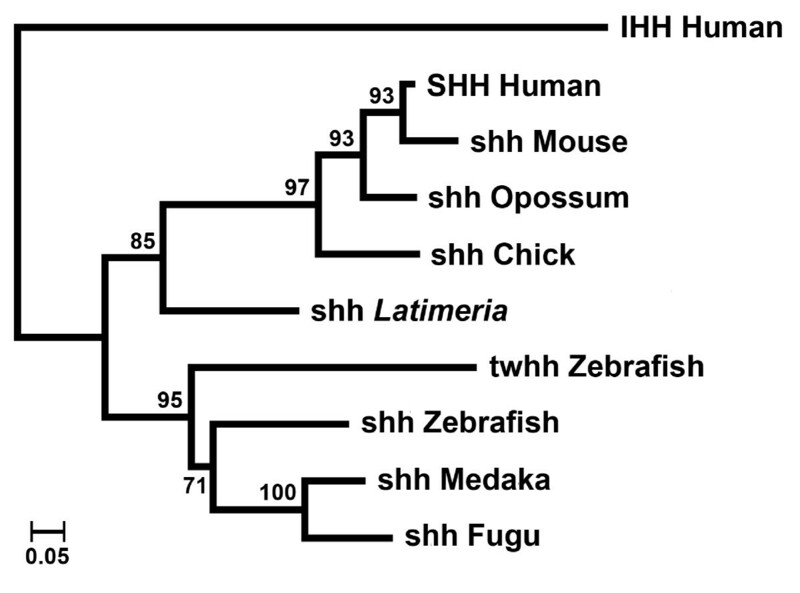 Phylogeny of vertebrate shh. RaxML Maximum likelihood tree , (JTT Matrix), with shh protein sequences, rooted with human IHH. Numbers above nodes indicate bootstrap support (100 replicas) [GenBank accession numbers: SHH human: NM_000193.2, shh mouse: NM_009170.2, shh chick: NM_204821.1, shh zebrafish: NM_131063.1, twhh zebrafish: NM_131199.2, shh Fugu: AY690624.1, IHH human: XM_050846.3]. The deduced cds of Medaka (Oryzias latipes) and opossum (Monodelphis domestica) were extracted from genome data. The Latimeria menadoensis shh cds was deduced from DNA sequence alignments. We identified the homologous conserved sequences in the Latimeria menadoensis shh genomic region that were identified previously in various lobe-finned and ray-finned vertebrates [42–45]. Several noncoding conserved sequences were detected in intronic and upstream regions of shh, and the distribution and frequency of these conserved blocks followed recognizable patterns. They overlap with the previously characterized enhancer regions of zebrafish and mouse (Figure 2a). shh locus (a) VISTA plot of the shh genomic region ( Latimeria menadoensis shh as reference sequence). Shuffle-LAGAN alignment (repeatmasker applied), visualized with mVISTA. Black peaks indicate conservation of coding sequences. The crossbar indicates the deduced Latimeria shh gene structure (black: exons). Enhancer locations are indicated by grey bars. Repeats are indicated by yellow bars. (b) Overall Conservation of CNE. Histograms present sum lengths of DNA sequence conservation in the shh genomic region from pairwise comparisons within the genomic region from SFPE1/ar-D enhancer to the shh 3' end (for zebrafish-, medaka- and fugu from the putative ar-E enhancer to the shh 3' end). Alignments were established with mLAGAN, conservation parameters for CNE identification were set as: Min Y: 50, min Id: 70, Min length: 60. CNE that mapped shh untranslated regions were excluded from the analysis. An upstream enhancer, SFPE1, directs shh floorplate expression in mouse. Two other enhancers within intron 2, SBE1 and SFPE2, drive shh expression in the ventral brain and notochord [32, 36]. In zebrafish, the enhancers ar-A and ar-B in intron 1 and ar-C in intron 2 mediate shh expression in the notochord and the ventral neural tube. Both ar-A and ar-C predominantly mediate notochord expression, while ar-B predominantly directs shh expression in the floorplate [33, 40]. The intronic enhancer ar-A is well conserved in all analyzed sequences. A second peak of conservation upstream of the Latimeria shh gene was detected to correspond to the enhancer ar-D in zebrafish or SFPE1 in mouse. Conservation of this region among Latimeria and other sarcopterygians was detected in a region of approximately 300 bp, which expanded conservation to zebrafish ar-D by 50 bp at the 5- and 150 bp at the 3 end (Additional file 1). Furthermore, the ar-D enhancer is not conserved in pufferfishes (e.g., Takifugu rubripes) and medaka (Oryzias latipes). The third peak of conserved sequence found in Latimeria is the region corresponding to ar-B, a floorplate-specific enhancer in zebrafish. It showed similarity with actinopterygian and with marsupial species, but with none of the other sarcopterygians for which genomic data are available. 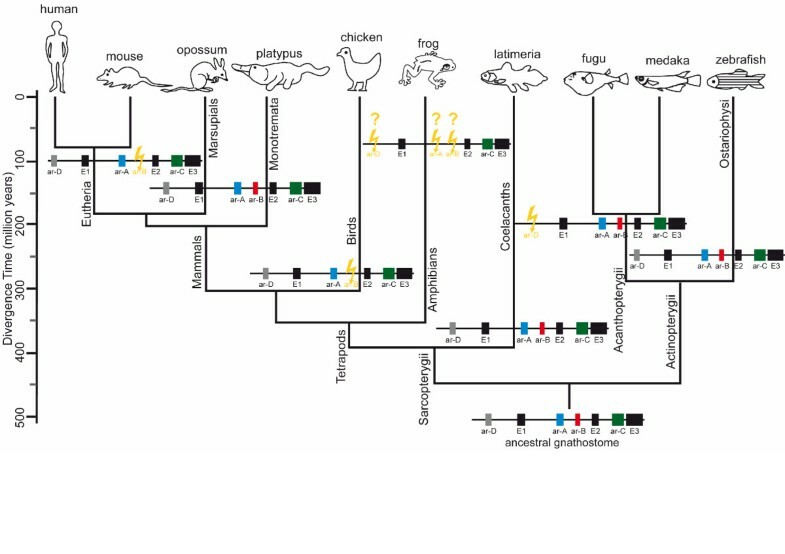 This result suggests that the ar-B enhancer has been lost independently in the different tetrapod lineages. In opossum, the sequence that retains ar-B conservation is interrupted with approximately 230 bp of repetitive DNA. The 5- part of this conservation is further conserved in shh loci of placental mammalian species, such as human (Additional file 2). It forms part of a diverged mammalian-specific CNE that vice versa is only rudimentarily conserved in Latimeria. In summary, Latimeria has retained conservation of all four putative enhancers that were previously described in the actinopterygian zebrafish. A fourth region with CNE was detected in the second intron. This is the region corresponding to ar-C in zebrafish (and SFPE2 enhancer in mouse). This region was previously shown to be strongly conserved in Latimeria. Therefore, all four enhancers must have evolved before the split between the lobe-finned and ray-finned fish lineages. Overall conservation of noncoding DNA was estimated to get a more quantitative measure of shh CNE in the different lineages. We calculated the sum lengths of CNE from pairwise comparisons of two shh genomic regions, spanning from the SFPE1/ar-D upstream enhancer to the shh 3'-UTR (Figure 2b). As no conservation was found to ar-D in medaka and fugu, for further analysis, the 5' limit of teleost shh genomic regions was defined to be a teleost-specific CNE further upstream (Additional file 3). Notably, Latimeria shows the highest sequence similarity with chick among vertebrates. Conservation is comparatively high with opossum but remarkably reduced when compared to mouse and human. Compared to actinopterygian species, sarcopterygian shh genomic regions share more CNE relative to their phylogenetic distance [46–48]. Conserved Latimeria enhancer sequences were analyzed for putative transcription factor binding sites using the JASPAR CORE vertebrata database  (Additional file 1). Binding motifs of those transcription factors were searched, which are known to be expressed in the neural tube, especially the floorplate [36, 50]. Several elements were found, such as homeobox or IRX elements, and we detected putative FoxA2 binding sites in the ar-A and ar-D enhancer. The ar-D FoxA2 putative binding site was only conserved among sarcopterygians but not in zebrafish. FoxA2 is a floorplate-specific transcription factor, and a FoxA2 element was also shown to be functional in the mouse SFPE2 enhancer . Finally, we examined the rates of divergence within conserved shh enhancer sequences among sarcopterygian species with the relative rate test . This test estimates different rates of DNA sequence diversification between two lineages by comparing them to an outgroup sequence. The DNA sequence alignments were obtained from partial enhancer regions that were found in all analyzed species (Table 1, Additional file 4). We used either Latimeria or zebrafish as outgroup sequences. Congruent to the overall conservation, the mammalian enhancer sequences showed elevated rates of divergence compared to chick or Latimeria, with opossum putative enhancer sequences at intermediate rates and the placental mammalian species at highest rates (Table 1). In conclusion, all CNEs that were previously identified either in mouse or in zebrafish are present in Latimeria and thus are candidate enhancers of shh expression in the Latimeria embryonic midline. * The equality of evolutionary rate between ingroup sequences is tested using the outgroup sequence. The χ2 test statistic and probability values are listed. Enhancer alignments are shown in Additional file 4. Species generic name abbreviation Lme: Latimeria menadoensis, Danio: Danio rerio (zebrafish), Opo: Monodelphis domestica (opossum). The enhancers ar-A, ar-B and ar-C of zebrafish and the SBE1, SFPE1 and SFPE2 of mouse shh were mapped by functional analysis to overlap exactly with conserved noncoding sequences [32–34, 36, 40, 43, 44]. However, the SFPE1 orthologous enhancer in zebrafish, denoted as ar-D, is a 2.4-kb fragment that is too large to suggest that the CNE within contains the functional enhancer. 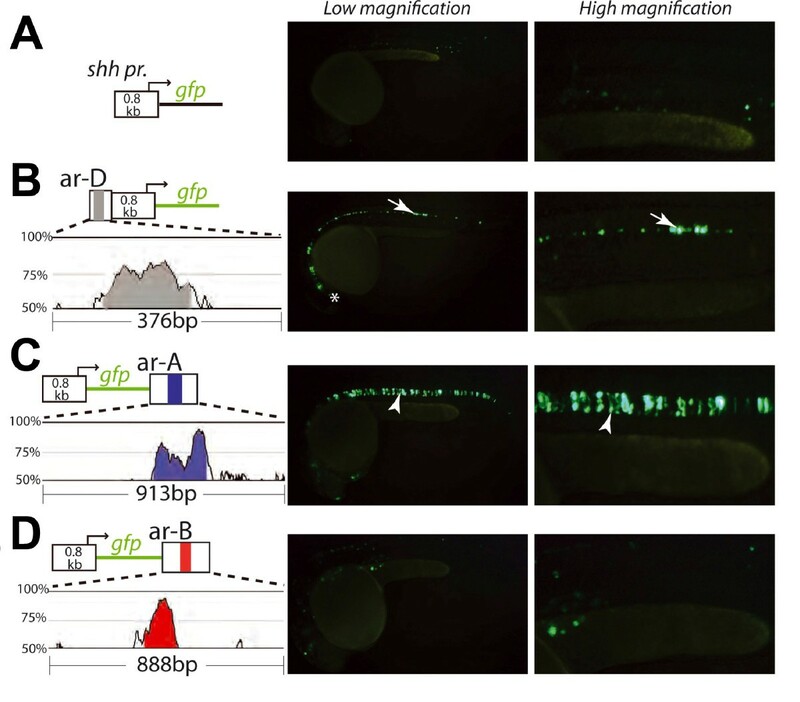 The fine mapping of the zebrafish ar-D enhancer was carried out to confirm that the conserved zebrafish ar-D sequence is reponsible for the enhancer effect in the 2.4-kb fragment. This would improve the predictive value of this CNE in predicting a Latimeria enhancer. Five partially overlapping DNA fragments of 500 bp or 700 bp were coinjected with a minimal 0.8-kb shh promoter construct  linked to a LacZ reporter (Additional file 5). Weak activation of notochord and floorplate expression was observed for fragments that represent the shh 2.5- to 1.5-kb upstream region (fragments 2-5). The expression was not considerably higher than background staining and was probably originated from the 0.8-kb proximal shh promoter. Specific reporter gene expression in the anterior floorplate (anterior to the level of the yolk extension) was observed for DNA fragment 1, ranging from position -836 to -1339. The region that is responsible for the ar-D enhancer effect overlaps fully with a CNE that is present in all the other compared sarcopterygian sequences (Figure 2a). This region is further part of the mouse SFPE-1 enhancer. We thus postulated that this CNE would also function as a specific enhancer in Latimeria. To check whether the Latimeria conserved noncoding sequences had enhancer activity, reporter gene expression analysis was conducted in transient transgenic zebrafish embryos. This analysis had already been carried out with Latimeria ar-C in a previous study , and the aim here was to analyze other conserved regulatory regions that potentially drive shh midline expression. Conserved noncoding elements of Latimeria shh intron 1 located between exon 1 and the intronic enhancer ar-A did not drive specific reporter gene expression (data not shown). Latimeria putative enhancer orthologs ar-D, ar-A and ar-B were cloned into the above-mentioned shh minimal promoter constructs, containing GFP (Green Fluorescent Protein) instead of a LacZ reporter. Transient mosaic expression of GFP was measured as read out of reporter construct activity 24 hours after injection of zebrafish zygotes (Figure 3). The reporter expression directed by the zebrafish shh upstream region resembled the tissue-specific expression of the isolated ar-D enhancer (Additional file 5). GFP expression was observed in the ventral brain and in the anterior parts of the floorplate (data not shown) [33, 40]. Similarly, Latimeria ar-D also directed floorplate-specific GFP expression (Figure 3b). However, the reporter expression was extended to the posterior parts of the floorplate. Among GFP-expressing embryos, fluorescence in the posterior floorplate cells (posterior to the start of the yolk extension) was detected in only 4% of specimens with the zebrafish upstream region but in 75% of corresponding embryos with Latimeria ar-D (Table 2). These results indicate that the CNE in the Latimeria upstream region is a functional midline enhancer which has similar but not identical activity in zebrafish to the zebrafish ar-D enhancer. On the basis of our DNA sequence comparison, Latimeria ar-D was found to contain sarcopterygian specific sequences with a puative FoxA2 element (92% match). Potentially, these elements can account for the posteriorly extended expression direction of Latimeria ar-D in the ventral neural tube of zebrafish. Classification of GFP-expressing Embryos from Transient expression Experiments. N° GFP-positive cells per embryo of each construct in the expression domains of interest. The abundance of GFP-expressing embryos below and above the threshold is shown (15 GFP-positive cells per embryo). Abbreviations: A: anterior floor plate; P: posterior floor plate. Functional assay of Latimeria ar-A , ar-B , and ar-D enhancers in zebrafish. Two fluorescent images are shown for each embryo. Low magnification displays the whole embryo and high magnification focuses on the trunk above the yolk extension. Schematic representations of the injected zebrafish (z) and Latimeria (l) promoter (pr) and enhancer reporter constructs are shown on the left side of each panel (a-d) VISTA plot comparisons of the zebrafish and Latimeria enhancer regions are shown below reporter constructs and indicate the degree of conservation. Conservation identity greater than 70% is highlighted in color. (a) Embryo injected with control construct containing the 0.8 kb (form the transcriptional start site) zebrafish shh promoter, linked to GFP. (b-d) Embryos injected with reporter constructs containing the minimal zebrafish shh promoter and one of the Latimeria shh enhancers ar-D (b) ar-A (c) and ar-B (d). GFP expression in the floorplate is indicated by arrows and the arrowheads point at expression in the notochord. The Latimeria conserved sequence that overlaps with the zebrafish ar-A enhancer drives specific expression in the notochord indistinguishable to the activity of zebrafish ar-A (Figure 3c). This result indicates that Latimeria indeed carries a functional ar-A enhancer. However, no activity could be detected from the Latimeria ar-B orthologous fragment when the conserved region alone or a broader region of 888 bp were tested at 24 hpf and 48 hpf (hours post fertilization) (Figure 3d and data not shown). Since a Latimeria ar-B enhancer may have diverged from that in zebrafish, a sarcopterygian model system was chosen to test putative Latimeria enhancer function. Latimeria ar-B enhancer activity was tested in chick, which is evolutionarily more closely related to Latimeria than zebrafish and shows higher overall noncoding DNA sequence similarity with Latimeria. This might also imply higher conservation of cis- and trans-interactions. Besides, the ar-D enhancer was also tested for reporter expression activity in chick. Since Latimeria ar-D directed posterior floorplate expression in zebrafish, the question arose whether this anteroposterior restricted pattern of activity is due to a zebrafish-specific trans- effect or if it is a more general response also seen in chick. As many transcription factors are supposed to have pleiotropic functions , the trans-acting factors may thus evolve independently to responsive cis-regulatory regions. In this case, trans-factors may be present in the chick neural tube, although the ar-B enhancer itself is absent in that species. The previously described Latimeria ar-B and ar-D gfp- reporter constructs were electroporated either in the hindbrain or in the spinal cord of chick embryos. GFP reporter gene expression was compared to control electroporations with the zebrafish 0.8-kb shh promoter construct, carried out in parallel. We also carried out another control experiment with the construct -2.4shh:gfpABC . This plasmid contains regulatory regions equivalent to plasmid I1+I2-2.2shh::lacZ characterized by Müller et al. (2000)  and was shown to be specifically expressed in the floorplate of the chick neural tube (Figure 4, Table 3). Weak or no background GFP expression in the spinal cord was detected with the 0.8-kb shh control plasmid. Electroporation with the Latimeria ar-B enhancer resulted in significantly enhanced GFP expression. However, the expression pattern was not specific to the ventral neural tube. This result suggests that the Latimeria ar-B sequences carry enhancer activity but are either not restricted to the ventral neural tube or are interpreted in a nonspecific fashion in chick. The Latimeria-arD enhancer directed tissue-specific GFP expression in the floorplate, both in hindbrain and in the posterior spinal cord. This result is similar to those observed in transient transgenic zebrafish (Figure 3b). Functional assay of Latimeria ar-B , and ar-D enhancers in chick. (a) GFP expression in the hindbrain and in the posterior spinal cord obtained with the Latimeria enhancer constructs and with the zebrafish 0.8 kb shh promoter region as negative control. GFP expression was detected by immunostainings, except for ar-D expression in hindbrain where the direct GFP fluorescence is shown. The neural tube (nt) and the notochord (n) are indicated in the images. Sections of the hindbrain are posterior to the tegmentum (posterior to midbrain-hindbrain boundary and anterior to the otic vesicles). Sections of the spinal cord are at the level of somite 33. (b) Histograms, presenting amounts of GFP posivite cells in the floorplate and lateral neural tube. The number of fluorescent cells were counted from prepared sections of electroporated embryos. (c) Positive control electroporation with the construct -2.4shh:gfpABC . Number of GFP-expressing chick embryos in eletroporation experiments. N° GFP-positive embryos/N° electroporated embryos. Summarizing, only the predicted Latimeria conserved enhancers ar-D and ar-A were found to be functional in zebrafish. The Latimeria ar-B enhancer was providing unspecific enhancement of GFP expression in chick, both in the hindbrain and in the posterior neural tube. These results suggest that all three regions are functional enhancers in Latimeria, albeit that experimental verification in Latimeria is currently not feasible. 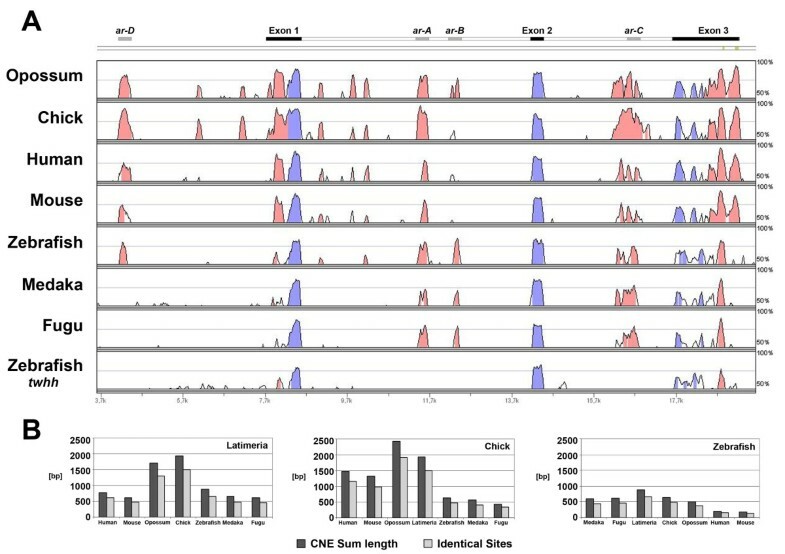 The shh genomic region of Latimeria menadoensis reveals conservation of all four actinopterygian shh midline enhancers, which indicates an ancestral-like and rather unchanged cis-regulatory architecture of Latimeria shh. Several previous studies with Latimeria enhancers of different loci or genomic regions are in agreement with this interpretation. The analysis of the Latimeria procadherin gene clusters  described the Latimeria genome as being very stable and having suffered very little from diversifications such as gene duplications or gene conversion events. The characterization of Latimeria HOX clusters revealed a consistently slower diversification of Latimeria CNE with repsect to tetrapods . The Latimeria orthologous Otx2 enhancers FM and AM  as well as the HoxC8 early enhancer  revealed strong DNA sequence conservation across vertebrates. Otx2 enhancer expression direction was similar to that obtained with skate orthologs, and the HoxC8 early enhancer was described to direct gene expression in mouse, similar to the mouse ortholog. Our study extends the observations cited above to the characterization of a set of proximal regulatory modules within a locus. With availability of the Latimeria genome sequence, a more comprehensive comparative genomic analysis should be possible with a multitude of developmental regulator genes. Such an approach may also reveal how far conservation of cis-regulatory regions at developmental regulator genes is related to its ancient type morphology. Conservation of the four enhancers ar-A, ar-B, ar-C and ar-D in Latimeria and zebrafish reveals preservation of an ancestral set of enhancers that originated before the split between ray-finned and lobe-finned vertebrates (Figure 5). Lineage-specific losses of ar-D and ar-B are observed in more derived species. Those are likely structural enhancer rearrangements that display a functional turnover within a cooperating system  of cis-regulatory regions at the shh locus. Hypothetical evolution of enhancer structure of shh loci in vertebrates. The structure of the shh locus is schematically represented for each vertebrate linage on the tree showing vertebrate evolutionary relationships. The enhancers are highlighted in color: blue: ar-A; red: ar-B; green: ar-C and gray: ar-D; exons (E1, E2, E3) in black. The lightning symbol (yellow) indicates enhancer loss in the corresponding vertebrate linage. Question marks indicate incomplete sequence data. The species divergence time scale was adapted from literature data [46–48]. So far, there is not enough data available on shh proximal genomic regions of ancestral gnathostomes (represented by chondrichthyes such as sharks). However, there is reason to speculate that the intronic and upstream enhancers are potentially present in such species. Embryonic expression of shh in the embryonic midline has been shown to be strongly conserved in distantly related vertebrate species such as lamprey  or dogfish . The analysis of total conservation of CNE (Figure 2b) in the shh orthologous genomic regions indicates interesting trends in the conservation of CNE across actinopterygian and sarcopterygian species. A lower overall conservation is observed among teleost species. Less conservation of noncoding DNA in teleost lineages has also been reported previously in DNA sequence comparisons of vertebrate Hox clusters , which was related to the fish-specific genome duplication . Among sarcopterygians, we found an elevated similarity of CNE between Latimeria and chick and lower conservation to the mammalian sequences. It indicates that the shh genomic region has stayed remotely constrained across sarcopterygian evolution but has more recently diversified in the mammalian lineage. Comparisons of the conserved blocks of the enhancers ar-A, ar-C and SFPE1/ar-D by relative rate tests  are in line with this interpretation. Mammalian orthologs show substantially more diversification than chick or Latimeria. Likewise, the mouse ar-C orthologous enhancer SFPE2 is floorplate-specific and has been reported to be inactive in transgenic zebrafish . Chick and Latimeria orthologs  showed notochord specific expression, similar to the zebrafish ortholog [32, 34, 40]. The analysis of expression of putative Latimeria orthologous enhancers in transgenic zebrafish and chick provided confirmation of functionality, though it cannot definitively corroborate the endogenous tissue specificity in Latimeria. Although similar, there are qualitative differences in expression patterns generated by the Latimeria ar-D sequence and the 2.4-kb zebrafish shh upstream region that contained the ar-D enhancer. This region directed expression in anterior parts of the floorplate and the ventral brain. The expression of the Latimeria ar-D enhancer in the posterior floorplate can potentially result from enhancer regions that are only conserved among sarcopterygians (Additional file 1). Those regions can contain elements, such as the the putative FoxA2 binding site, which are bound by floorplate-specific transcription factors. A FoxA2 binding site was previously shown to be functional in the mouse floorplate-specific enhancer SFPE2  and the mouse ar-D orthologous enhancer (SFPE1), characterized in mouse, also revealed to drive reporter gene expression in posterior parts of the floorplate . However, as these regions were analyzed in different model organisms, these data may not fully be comparable. Also, the mouse SFPE2 enhancer is inactive in zebrafish  but contains a functional FoxA2 element. Thus, other elements may be responsible or additionally required for posterior floorplate expression of Latimeria ar-D. The subtle differences in reporter gene expression by orthologous enhancers from different species have also been reported previously and appear to be a common phenomenon [24, 33, 34, 36, 55]. Divergent expression direction may possibly be explained by different binding site compositions of the orthologous enhancers or differing transcription factor availability and affinity to the same set of transcription factor binding sites among different species. Similar to the observed changes in ar-D activity, Latimeria ar-B proved also to be differently interpreted in zebrafish, compared to its zebrafish homolog. In the transgenic reporter assays employed, Latimeria ar-B did not drive reporter gene expression in zebrafish. However, an unspecific activation of GFP expression by Latimeria ar-B was observed in chick embryos. This suggests that ar-B is a functional cis-regulatory region in the first place. The lack of tissue-specific expression might simply reflect different interpretations of ar-B enhancer elements in zebrafish, chick and Latimeria. We observed conserved sequences among teleost species that map zebrafish ar-B but that are not present in Latimeria (Additional file 1). Those regions may be required to obtain specific reporter gene expression. Again, changes in transcription factor binding site composition and transcription factor availability and affinity can result in reduced responsiveness of the reporter system applied in different species. Alternatively, Latimeria ar-B might require the cooperation with other enhancers for tissue-specific activity. As zebrafish shh floorplate enhancers cooperate with each other , there might be a balancing gain and loss of enhancer functions among the complete set of shh midline enhancers that together preserve the tissue-specific activity. Similarly, shh and twhh reporter constructs showed ectopic activity when a limited number of enhancers were assayed out of context of additional enhancers [33, 56]. Following this speculation, the loss of tissue-specific activity of one enhancer might be complemented by a gain of tissue specificity through synergism with another enhancer. Keeping in mind the limitations, cross-species reporter analysis remains the only approach to obtain expression data of Latimeria cis- regulatory elements. An open question that has not been addressed in this study is whether Latimeria carries orthologous putative shh long-range enhancers. A CRM that regulates shh limb bud expression is located 1 mb away from mouse shh within the lmbr1 locus. This enhancer was found to be conserved in most vertebrate lineages, including chondricthyes [35, 38, 39, 57–60]. Other shh long-range enhancers have been detected, such as endoderm-specific enhancer elements  and the ventral forebrain specific enhancer SBE2. This latter CRM is conserved only in sarcopterygians and is located in humans at a distance of 460 kb upstream of SHH [35, 37]. A Latimeria genome project will therefore be immensely useful in addressing the presence such long distance cis-regulatory modules. The Latimeria menadoensis shh genomic region represents a locus with the ancestral set of enhancers that emerged before the split of lobe-finned and ray-finned fishes. In contrast to more derived vertebrate lineages that exhibit losses and rearrangements of shh enhancers, Latimeria reveals low levels of enhancer sequence evolution and high overall conservation of noncoding DNA at the shh proximal genomic region. The conserved cis-regulatory architecture of this set of shh midline enhancer is consistent with slow rates of evolution of the Latimeria genome. The high overall sequence conservation of shh CNE may be indicative of a high retention of ancestral cis-regulatory DNA in the Latimeria genome. The DNA sequence of shh Exon II was amplified by PCR from 100 ng of genomic DNA of Latimeria chalumnae using the oligonucleotides SHHE2F1: CNATHTCNGTRATGAACCAGTGG and SHHE2R1: CTGCTTTSACNGARCARTGDAT. The amplification product was ligated into the PCRII vector (Invitrogen, Carlsbad, CA, USA), transformed, and single clones from transformations were isolated and prepared. The insert of each clone was sequenced using the primers M13(-20) and M13(reverse) on an ABI PRISM 3100 Genetic Analyzer (Applied Biosystems, Foster City, CA, USA), using the Big Dye Termination Reaction chemistry (Applied Biosystems). Suitable clone inserts were used as DNA template for the preparation of a 233-bp shh-specific 32P-labeled probe for BAC library screening. 32P-labeling was achieved by random priming . The Latimaria menadoensis BAC library VMRC4  was screened for shh-specific BAC clones. One nylon filter set was hybridized overnight in 0.6 M NaCl, 0.02 M ethylenediaminetetraacetic acid (EDTA), 0.2 M Tris pH 8.0, 0.5% sodium dodecyl sulfate (SDS) and 0.05% sodium pyrophosphate at 65°C with the shh-specific probe. The filters were washed twice with 1 × saline-sodium citrate (SSC), 0.1% SDS, once for 30 minutes at room temperature and once for 40 minutes at 37°C. Three shh-positive BAC clones were isolated. Large-scale BAC clone preparation was obtained with the Large Construct Kit (Qiagen, Hilden, Germany). A total of 20 μg of BAC clone DNA in 500 μl TE (10 mM Tris, 1 mM EDTA), pH 8.0, was fragmented by sonication (Branson Sonifier, Danbury, CT, USA) with 4 × 1-second pulses at 300 W (5-mm microtip). The 2- to 3-kb fraction was isolated from the sheared DNA by preparative gel electrophoresis. DNA fragments were end-polished with Klenow enzyme (Roche, Basel, Switzerland) and blunt-end ligated into pUC18 vector (Roche). Resulting bacterial clones from transformations were isolated into 384-well plates and grown in 1 ml LB (Luria-Bertani) broth (50 μg/ml ampicillin). The subcloned BAC clone 123-O2 was sequenced using the shotgun approach. Clone plasmid DNA was prepared manually. The inserts were sequenced directly with the universal primers M13(-20) and M13(reverse) as mentioned above. Sequences were quality trimmed with PHRED  and assembled with the Sequencher software (Gene Codes, Ann Arbor, MI, USA). DNA contigs were aligned to vertebrate shh sequences and to conserved noncoding elements of shh genomic regions, obtained from the UCSC genome browser . Contig gaps were closed by PCR with gap-specific primers and direct sequencing. Phylogeny reconstruction with shh coding sequences was performed with RAxML . The shh genomic regions of different vertebrate species were extracted with the UCSC genome browser or Ensembl genome browser (human SHH: hg18_dna range=chr7:155271852-155314196, mouse shh: mm8_dna range=chr5:28769694-28815809, opossum shh: monDom4_dna range=chr8:217895000_217995000 chick shh: galGal3_dna range=chr2: 8007268-80525245, zebrafish shh: danRer4dna range=chr7_49518680-49540684, zebrafish twhh: danRer4_dna range=chr2: 27256710-27288019, medaka shh: oryLat2_dna range=chr20: 17728012-17784191, Fugu shh: combination of two sequences: AJ507296.1 and fr1_dna range=chrUn:293195538-293226682 (misassembly in the Fugu genome sequence around shh exon1)). Annotations of genomic regions were done manually by DNA sequence comparisons and repetitive DNA was masked with repeatmasker  using wublast, default speed/sensitivity, masking interspersed and simple repeats. Genomic regions were aligned with the program Shuffle-LAGAN and alignments were visualized with the program VISTA (mVISTA, ; LAGAN Alignment program, . Conserved sequence blocks were also extracted using VISTA. For relative rate tests, alignment blocks were determined as conserved sequences that are found in all compared DNA sequences. Alignment blocks were established with Dialign TX , and relative rate tests were performed with MEGA4 . Latimeria shh enhancers were amplified by PCR from BAC clone DNA using specific oligonucleotides (Additional file 6). The oligonucleotide pairs optionally contained the restriction sites Sal I/Pst I, Not I/Sac II or Not I/Kpn I. PCR products were cloned into linearized plasmid vectors 0.8-kb shh:GFP [31, 34]. Microinjection solution (10-20 ng/μl circular plasmid DNA and 0.1% phenol red) was injected through the chorion into the cytoplasm of zebrafish zygotes. Transient mosaic expression of GFP in 24-hours old embryos was analyzed using a fluorescent stereomicroscope (Leica MZ FLIII, Leica Microsystems, Heerbrugg, Switzerland). The zebrafish ar-D enhancer and the Latimeria ar-G fragment was characterized in coinjection experiments, essentially as described in Müller et al. (1999) . Analysis of 24 hours old embryos was then carried out as described by Chang et al. (1997) . Transient mosaic expression was measured as readout of reporter construct activity by counting β-Gal-stained cells. PCR-amplified fragments of zebrafish shh upstream DNA regions were obtained with specific oligonucleotides (Additional file 6). In vivo experiments with chick embryos were performed by in ovo electroporation. Eggs from White-Leghorn chickens were incubated at 38.5°C in an atmosphere of 70% humidity. Embryos were staged following Hamburger and Hamilton (HH) . Chick embryos were electroporated with 2 mg/ml supercoiled plasmid DNA with 50 ng/ml Fast Green. Electroporations were carried out as performed by Müller et al. (2000) . This method was previously shown to yield transfections of dorsal, lateral and ventral cells of the spinal cord with transfection bias in lateral regions . Briefly, DNA was injected into the dorsal lumen of HH stage 11-12 neural tubes at two different levels: hindbrain or spinal cord. Electrodes were placed at both lateral sides encompassing the dorsal and ventral extremes of the neural tube. Electroporation was carried out in one direction (shown on the right side of Figure 4) so that the nonelectroporated half of the neural tube served as a negative control. Electroporation was performed with the Edit Type Cuy21 (Nepa Gene, Ichikawa, Chiba, Japan) electroporator delivering eight 50-ms square pulses of 10 V. Transfected embryos were allowed to develop for 24 hours. Chick embryos were fixed for 4 hours at 4°C in 4% paraformaldehyde in PBS, rinsed, embedded in 5% agarose, 10% sucrose and sectioned in a Leica vibratome (VT 1000S, Leica Microsystems). Immunostaining was performed following standard procedures. Briefly, sections were blocked with 10% goat serum in PBS-T (1x PBS (137 mM NaCl, 2.7 mM KCl, 10 mM Na2HPO4, 2 mM KH2PO4, pH 7.4), 0.1% Tween-20), incubated overnight with a rabbit anti-GFP antibody (Molecular Probes, Invitrogen) and detected using an anti-rabbit Alexa 488-conjugated secondary antibody (Molecular Probes). Images were collected by fluorescence microscopy. Michael Lang, Yavor Hadzhiev contributed equally to this work. We thank Prof. Manfred Schartl for donation of Latimeria chalumnae genomic DNA and to Prof. Fernando Giraldez for providing material and facilities for the chick electroporation experiments. We are grateful to Tsutomu Miyake, Joshua Danke, Ingo Braasch and Walter Salzburger for help and advice. F. M. was supported by EUTRACC and Transcode of the EU Framework programmes (contracts 511990 and LSGH CT 2006037445 and by the Deutsche Forschungsgemeinschaft (MU1768/2)). U. S. was supported by EC IPs ZF-Models and Eutracc and the Helmholtz Association. C. T. A. was supported by grants from the National Science Foundation (IBN-0321461, MCB-0719558). A. M. was supported by grants from the Deutsche Forschungsgemeinschaft. ML, AM, FM and YH designed the experiments. ML, NS and MBB sequenced the BAC clone and analyzed the data. CTA isolated the Latimeria shh containing BAC clones. YH prepared the Latimeria shh enhancer constructs, and YH and CP performed the Latimeria enhancer transgenic analysis. US and FM provided zebrafish enhancer coinjection analysis. ML, FM, CTA, YH and AM wrote the manuscript.